do we always need someone or something? who makes the dumb, or the deaf, or the seeing, or the blind? in other words, sports makes us happy! 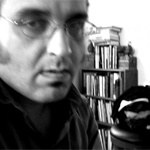 K. SILEM MOHAMMAD is the author of Deer Head Nation (Tougher Disguises, 2003), A Thousand Devils (Combo Books, 2004), and Breathalyzer (Edge Books, 2007). With Anne Boyer, he co-edits the poetry magazine Abraham Lincoln. He spends summers and yuletides in Johnson County, with frequent excursions to Lawrence.